Today's Draw Classic*: Shaman from the Vision Tarot by Dirk Gillabel. Can you sense the energy of those around you? Do you sometimes walk into a room full of people and feel overwhelmed for some reason you can't explain? Is there a person who, even though they're nice, you just don't like to be around? You've probably experienced it before...when someone is angry, you can feel it. They emit the energy of anger. No words have to be said. The person's face doesn't have to be contorted in an angry look. In fact, you've probably even felt someone's anger when they were doing their best to look normal and deny their anger. You can sense someone staring at you. You know when someone is lying to you. You may have felt that someone died before you knew it to be fact. Or maybe you felt creeped out by something you couldn't see, like a ghostly energy. Or you entered a room and it somehow felt peaceful. Some of this can be explained by visual or verbal cues. But some of it can't. Some of it you might call intuition or even instinct. But what really are instinct and intuition if it doesn't involve tuning into the energies around you? Every day we're interacting with energies you can see and not see. A person is an energy you can see, for example. But there's a whole other energy body within them and around them that you can't see. There are the electrical systems that run our heart and our every thought. There's the caloric energy that fuels our body. The kinetic energy of motion. And, many believe, an energy body made up of chakras. Spiritual energy that's transmitted between us and God. And energy that transmits between us and everything in the universe. A shaman is a mediator of those energies. Each day we make countless energetic exchanges with other seen and unseen energies around us. We understand the energy exchange of food, for example. You eat it and use its energy to power your body. But what about all the energy exchanges you make with unseen and unacknowledged energies around you? Just because you're not conscious of them, doesn't mean you're not interacting with them. Wouldn't you like to be more aware of those exchanges? That's what the shaman has come to us about today. To prompt us to start noticing energies around us. As you interact with people today, take a moment to note the kind of energy or vibe they put forth. Is Joe's energy laid-back and mellow or is he a quivering nerve all the time? How does his energy affect yours? If you walk into his cubicle when he's not there, can you feel his energy there? Likewise, if you walk into a store or a room or someone's office today, connect with how the room feels...the energy it emits. Or hold an item, preferably of someone else's and see what kind of energy it has attached to it. You may not feel anything the first time try, but keep trying. Before you can interact with energy, you first have to know it's there. And before you can shield yourself from unwanted energies, you have to understand how you interact with them. Energy exchange is a language all its own and it's something that was critical to the survival of early man. 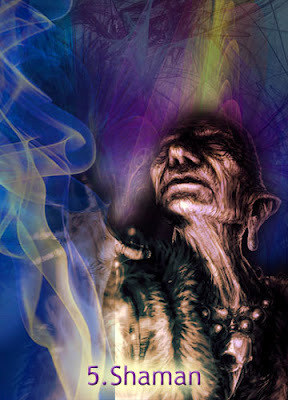 The tribe shaman was the go-to guy for everything from physical and spiritual healing to energetically ensuring a successful hunt through his interaction with the spirit world. He was the most venerated person in the clan. That's how important this skill once was to us. My own instinct tells me we can't let this ability slip away. It's a part of us we can't afford to lose to evolution. And it's a part of us we'd be remiss not to explore in this lifetime. So play around with it today. Nobody else even has to know. And see what you can tune into. At the very least, the more tuned in you are, the more information you have to guide you toward success.